GBL offers a full LED Outdoor landscape lighting line that includes, floodlights, step and path lights, up lights, deck and garden LED lights, shipped from Vancouver, Canada. These items are designed to handle Canada and the United States diverse and tough weather conditions. Some of these operate at 100-270 Volts but many are 12V AC/DC Low Voltage LED lights that can be used with our outdoor rated LED Drivers (Transformers), or existing 12 Volt Outdoor Magnetic transformers. This LED Step light can be installed into single gang junction boxes. Three trim style options available with an open face, a louver or a scoop that directs the light downwards. Available with a powder coated black, white or brushed nickel finish. Certified for indoor and wet location standards. This LED Step Light is also available in 12VDC for dimming and also colour changing RGB light. Our Retaining wall LED light is the perfect option to light rock walls, retaining walls and hardscapes. Durable outdoor rated and made of stainless steel, this 12 Volt light is placed between stone to light down walls, great for highlighting beautiful stone work, planters, or steps. Various finishes available including Brushed chrome, black or stainless steel. 4 Foot wire lead is included and stocked near Vancouver in BC Canada. 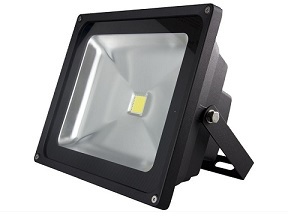 With a Powder Coated Black finish these Floodlights are available in either 30Watt or 50Watt COB options. cULus Listed for outdoor use with a 100-270 Volt input. Replaces Halogens or High Pressure Sodium (HPS) and are ideal for billboards, Signs, gardens, as uplights for Trees or Architectural features. Our newest to our 2016 LED line shown is our sleek and modern outdoor path light. Draws 3 Watts of power and is easily our fastest growing outdoor landscape light. Stands 18 inches, includes a stake, contact us for further details. 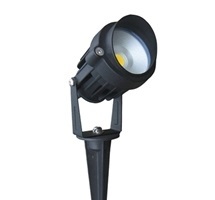 This outdoor rated LED stake uplight has a 5 Watt Single LED enclosed in a fully sealed black powder coated housing. The head on this fixture can be rotated to focus where light is needed. 300 lumens using only 5 Watts with a 60 degree light spread. Ideal for tree or plant highlighting, to detail architectural features, path lighting or sign lighting. This small recessed LED light is fully sealed for exterior applications. 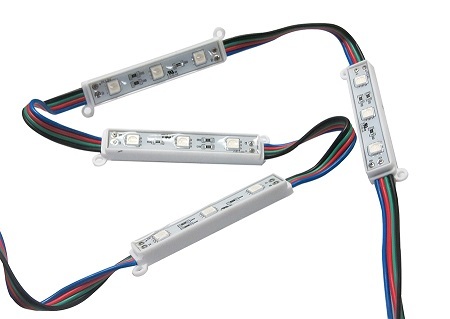 Available with 1 Watt power LED, or the more popular 6 LED version, or in RGB colour changing. This step light is easily installed in walls or wood or metal. The Brushed nickel trim is individually machined and draws minimal power. Great for step lighting, deck lighting, path light or even as a livewell light. GBL offers a range of LED Strip lighting that is flexible and easy to use. Our outdoor strip lights can be cut every 3 LEDs to customize to your lighting requirements on site, great for step lighting, lighting planters, walkway lighting, GBLs LED strip lighting is an easy customizable option for your landscape LED lighting project. For your customers who want to use standard lighting fixtures on there yachts or RVs or who need Low Voltage LED PARs for Signage or Billboards we've developed a PAR LED bulb that is low voltage 10-30VDC but has a standard E26 medium base. In Vancouver BC Canada, for Low Voltage we also stock our E26-LB60 LED omni directional Lamp that is also 10-30V DC (voltage regulated) 12VDC, 24VDC PAR30 LED flood lamp, pictured here. Newly available, for Architectural building details, GBL now offers a CSA, UL Listed RGB Wall Washer that is both indoor and outdoor rated. At full power they use 55 Watts, they have a plug for direct 120V use, and have daisy chain cables to connect up to 10 in a line. Each has a built on RGB Control where you can choose 100's of preset sequences or you can set them up with a DMX control. Great for Signage, Building highlights, Landscape applications and Nightclubs. GBL stocks both RGB colour changing Modules and single colour White LED Mods. Fully sealed for indoor or outdoor use these LED modules have 3 x 5050 SMD LEDs enclosed in a sealed housing with a durable 3M Tape. cRUus Listed and stocked in Vancouver, BC Canada. 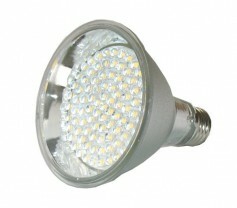 Both our LED R20 and R30 Bulb are cULus listed and Damp Location rated, for outdoor use. The R20 is dimmable drawing 7Watt with Samsung LEDs, while the R30 is also dimmable drawing 12 Watts of power. Both these bulbs are know as BR20 and BR30 LEDs have frosted housings for difused light with a wide flood 120 degree light output. Outdoor LED Strip lights, LED deck lights Canada, Vancouver outdoor lights, Washington outdoor leds, Path LED lights, Deck lights, Garden and pool lighting, low voltage LED lights for outdoor use. LED landscape lighting BC Canada, Outdoor LED lights Abbotsford.